The diversity of weather in St Lucia provides the perfect climate for adventurers and beach goers alike. Check out the latest St Lucia weather forecast below. Those who seek the wet, lush tropical rain forests of the Caribbean often think of St. Lucia as our destination of choice. The trade winds supply comfortable and pleasant sea breezes to the weather in St Lucia to cool you from the balmy evenings in this paradise. That does not mean, of course, that the sun worshipers and divers among us cannot enjoy this island. Most of the Caribbean islands boast more than one type of ecosystem and St Lucia is not different. The west coast (Caribbean Sea side) of the island has several lagoons and tepid warm coves to please the any scuba diver. This side of this Caribbean island also tends to have milder temperatures and is sheltered from the prevailing winds. 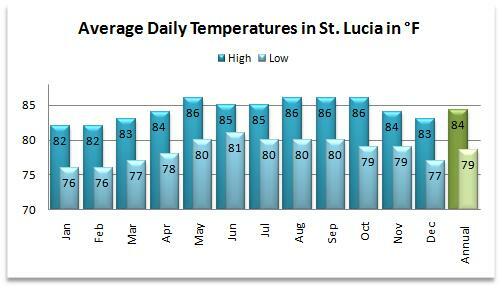 The St Lucia weather forecast generally sees average temperatures during mid-summer between 78°F and 86°F (25.6°C and 30°C). In the winter months the temperatures are around 79°F (26.1°C). During these months, the St Lucia weather forecast also tends to see less rainfall. As you ascend to the higher elevations of St Lucia (such as the famous Pitons), the number of waterfalls and the lush vegetation that allows for cooling mists increases. This keeps the temperatures in the St Lucia weather forecast between 65°F (18.3°C) and 75°F (23.9°C). The annual Rainfall is St Lucia is around 60 inches with 45% of the rain is expected during the hurricane season (June  November). As is common in the Caribbean islands, rain showers often come on suddenly, but also disappear with the same swiftness as they appeared, bowing to the warm tropical sun. St Lucia is in the hurricane belt, and is affected by a strong tropical system once every 3.5 years or so on average. However, the island rarely experiences a direct hurricane hit, averaging a direct hit only one about every 20 years. Hurricane Dean was the last tropical system to affect this Caribbean island when it passed between St Lucia and Martinique on August 17, 2007. The weather in St Lucia may be touched here and there by a strong tropical storm, but this Gem of the Islands boasts beautiful rain forests and relaxing beaches that meet crystal clear waters. Therefore, St Lucia would be an excellent place for your next vacation destination.